Rebel Jam 2012 in Spain and with Flatland! Good news! As you may remember flatland was finally part of the Rebel Jam last year in Eindhoven. According to the German Freedom BMX mag it's going to stay that way. Flatland at the Rebel Jam! 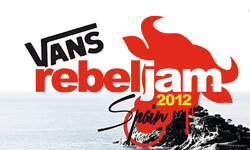 In 2012 the Rebel Jam will move to the Mediterranean Sea. Nice! The location will be the Eurocamp skatepark (website) in Tossa de Mar, Spain which is a few km east of Barcelona. If you want to fly there then booking a flight to Girona airport (GRO) is a good option. Who is stoked to see flatland being part of a major BMX event?